We arrived in Lübeck on Saturday afternoon and stayed at a Camp Lübeck-Schönböcken about 4kms south of the city Centre. It was pretty basic but clean and had a nice vibe. It set us back 40 euro ($62) for the two nights and showers were 50c each for 5 minutes. Certainly no freebies in Germany! There were a lot of older German couples holidaying in their caravans and motorhomes. They would all say Hallo (an informal greeting in German) and wave, and start drinking beers after lunch each day! Of course my favourite couple were the ones with a black cocker spaniel. Dogs are widely accepted in all caravan parks, which is pretty cool. Yep, crazy dog lady right here. As mentioned in my previous post it was German Unity Day on Saturday and nothing was open. After setting up camp, which is a very arduous task of rolling out the awning and setting up a couple of camp chairs we went to find some dinner. The people who run the campsite recommended the closest place, which was just over a kilometer away, to us. We got there, and it was American style barbeque. No pork knuckle or bratwurst in site but beggars can’t be chooses! I’m pleased to note there was no public holiday surcharge. On Sunday we decided to walk in to town and stop along the way for breakfast. We left around 9:30am and most places we passed appeared shut. This is not good when you’re starving and in need of coffee. It quickly became apparent that the people of Lübeck are not early risers on a Sunday. It took us until 11:30am to find something to eat. The hangriness (being angry as a result of hunger) was real! As we were exploring, we noticed most eateries and shops didn’t open until 1pm. After we ate, we meandered around the Island which is only 1.7km long , we stumbled upon a market where we could buy fresh fruit and vegetables, nice cheeses, salami and Brad had some bratwurst. Lübeck is famous for marzipan and there were all sorts of creations made out of the icing. It was fun to look at but not being a big icing fan I wasn’t tempted to try the sugary treat. The city also has a lot of gothic architecture and interestingly, most of the city centre is a Unesco World Heritage listed site. So we walked outside, she opened the window, and then asked us what we would like. It seemed like adding an unnecessary step but good to know! That evening we did some laundry (so exciting) cooked some vegetables and rice in the RV’s kitchen and sat outside with a beer. At this point, we realised that the cutlery that was included in the RV hire hadn’t made it in to the kitchen. Would have been rather a funny sight watching us eat. Brad had the spatular and I had the ladle. Apart from our lack of cutlery, it was quite a nice end to the weekend and the excitement for being able to grocery shop the next day was setting in. On Monday morning we went to Aldi and guess what? IT WAS OPEN! I never knew grocery shopping would bring me so much joy. After getting food supplies and marveling at how cheap fresh raspberries were (and alcohol) we were on our way to Copenhagen. We approached the border of Germany and Denmark, which is about a 10 lane toll road. What I could make out from the signs, it looked like being an RV we had to go in the bus/truck lane. We soon found out when we were parked and Scarlett was being dwarfed that we were in the wrong lane… We ended up having to drive down a small grassy lane and start again. My goal this trip is to follow at least one sign correctly. We pulled up at the window to get our ferry ticket over to Denmark and our jaws hit the floor… 103 euro ($160.49) for a 45-minute ferry! After driving off the ferry it was an hour to Copenhagen. I had these idealistic dreams of being able to pull the RV up somewhere safe and stay overnight for free before the trip. As we’ve gone along we’ve decided to play it safe and book in to campgrounds. While researching Copenhagen we were concerned that 3 campsites had recent reviews of people’s tents and caravans being broken in to… WHILE THEY WERE SLEEPING IN THEM. Super creepy. So we stayed at the campsite that had good reviews and was subsequently very expensive… about $52 a night and let me tell you, it was a damn creepy place. It was wide open space, some fixed campervans were there, and other small vans with soul occupants. The Danhostel Ishojstrand may have 5 stars but I would strongly recommend AGAINST staying there. The showers were free, but I would much rather pay the equivalent of 85c per shower for a place that wasn’t the backdrop for the next horror film. Never fear, Copenhagen did improve! Luckily I have a Uni friend currently on exchange in Copenhagen (#uqadvantage) so we went in to the city and had dinner at Paper Island, which is an indoor version of Brisbane’s Eat Street Markets. I had a Danish hotdog and my first proper coffee of the trip. John took us on a bit of a walking tour of the city and offered to lend us two of his bikes for exploring the city the next day. After a nice evening we made it back to our creepy campground. After having to walk through housing commission at 10pm at night where six guys who looked like gang members were congregated on their scooters and were ready for bed. The wind picked up, the RV rocked, and I woke up every hour. Unfortunately the weather didn’t improve on Tuesday but we were determined to see as much of Copenhagen as possible so the boots and the rain jacket came on and we were off to be tourists! We got our bikes and the smaller bike went to me, which makes sense but as luck would have it, it was the bike with no front brake and no working gears. But never fear, Copenhagen is really flat and my legs got a good work out from both riding, and being used as a brake. We rode around the Island, went on a boat tour and ate ice cream in 12-degree weather. 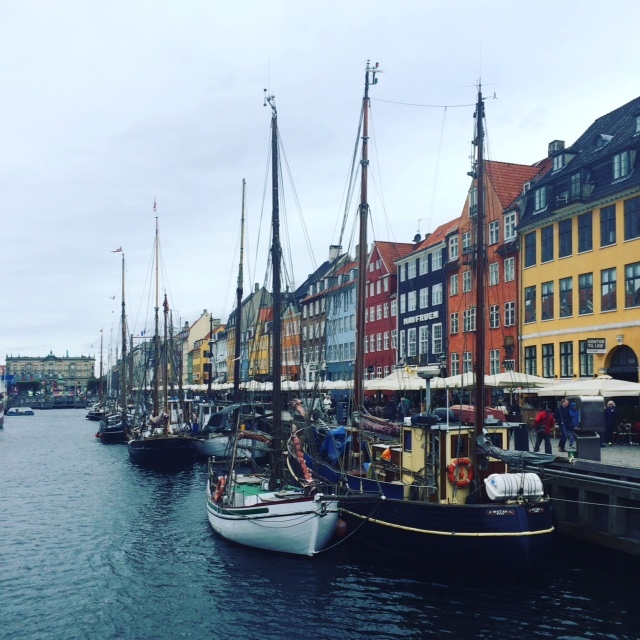 I especially loved Nyhavn, as bustling district with gorgeous buildings. After the boat tour we decided to branch out…. We had heard about Christiania, a hippy commune that was described as a vibrant place and a cool one to check out. Having been thoroughly impressed with the socially progressive side of Amsterdam I was expecting something similar. How disappointed we were. I didn’t see too many hippies; more like people I would put money on being in gangs. There were neck tattoos, balaclavas, dingy bars and eateries and bulk tattoos and piercings. Brad and I were attracting all sorts of strange looks and got out of there real quick. I’m really surprised at our take on it given this article talks it up to be some magic alternative wonderland. After a few wrong turns, climbing up a bell tower to take in the views of the city, Brad and I went our separate ways for a couple of hours to explore. I had a look in a couple of shops and then much to everyone’s surprise I’m sure, I just wasn’t in the mood! I saw a bar and thought I would grab a drink. I opened the door to said bar, didn’t see the step and literally fell in. When I looked up, the small bar, occupied by men only, were in fits of laughter. My first thought was dread, had I just walked in to a men’s club? Apparently I hadn’t, and in perfect English the bar tender said, “With an entrance like that, you deserve a free beer!” so I had my Indian Pale Ale, drank it sheepishly in the corner and left as soon as I could, minding the step of course! WeI made it back to the campsite we couldn’t wait to leave and the winds had picked up to over 50 km/hr and Scarlett was shaking and rocking. I’m pleased to say we made it thought the night. At the end of the day, we had cycled and walked over 16 kilometers and are currently driving through Sweden on our way to Norway. The scenery is beautiful so far and it’s not windy. What more could you want?! I don’t know which made you happier, the free beer or the lack of public holiday surcharge haha. I think I’m happy to skip Denmark in my future travels. I’m loving your comments about finding food, Britt. We had similar dramas in Istanbul where supermarkets are scarce and especially scarce in the Old City where we stayed. Finding a Carrefour on day 3 was a huge relief, I can tell you. Sadly, no Aldi in the countries we’ve just visited.